Available for delivery in Orange County California. 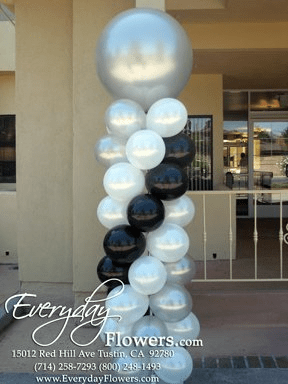 Let Everyday Flowers create custom balloon columns for any occasion. Choose different colored balloons for the column and different colors and shapes for the large topper of the balloon column. Need More Information? Call us today and we will be more then happy to answer any questions that you may have about our services. For parties events and grand openings balloon columns are air filled balloons and created around a pole weighted down with a metal stand. Our balloon columns are constructed using 6 11 inch air filled latex balloons and a 32 inch top balloon is placed at the top. They can be moved around after they have been constructed on site. They measure 8 feet tall. You can choose up to 4 colors and a matching top balloon. You can reference our latex balloon page to see the many colors available that can be used to constructed the balloon arch. Equipment includes a metal pole with an attached metal base that must be returned to our location after the event. An eight foot balloon column is $94.99 each. Our setup and delivery starts at $35.00 and will depend upon location, time and quantity of columns. Our normal setup times take place between 9AM to 4PM Monday Through Friday and Saturday from 9AM to 2PM. If you require balloon columns outside of our normal operating times there will be an additional fee.